LUXT played The Boardwalk last night as part of the Sac Amp show. This was the first of two live shows featuring the best of local rock and 98 rock puts out a great CD with one song from each of the chosen bands. Tesla's Brian Wheat is the producer too. The next live show is next Thursday night at Harlow's. 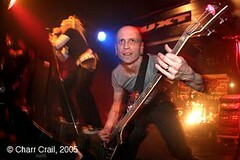 Also on the bill last night was Brand X Savior, Gooser and The Needs. Diddly Squat was the opening band for the Call Me Ishmael CD release show at Old Ironsides Saturday night. I'd heard about them, even visited their website. I was not prepared for the show, which I admit I loved though it was one of those things you watch wondering how you came to be there. But at some moment I looked off to the side and saw a girl watching them with a look of utter disbelief, her jaw slack, her eyes intensely on them and I knew we were of the same mind. As I studied her expression she must have felt me looking because she suddenly snapped out of it and looked right at me. A huge smile spread across her face, I nodded and mouthed the words "I know" and then we both began laughing so hard right in the middle of the whole thing. It was a great little moment. And Diddly Squat put on a very entertaining show. There was a bit of the Talking Heads/David Byrne quirkiness, a smidgeon of David Bowie in the very early days and incredible youthful vigor, which even included some rolling around on the floor by the lead singer. Check these guys out. Lots of fun! This is a color photograph shot in my studio today. Thanks to the ingenious and creative artistry of Paula who painted on enthusiastic (and remarkably patient) model Tabatha for a series of photographs. We did all kinds of fun stuff, including some reflective fun house images and a fun series with a tie dye background and pop art circles hanging down. Poor Tabatha had the worst of it. She was covered head to toe in multiple layers of paint and glitter, which took several hours to apply and most of the time she was standing up trying to be as still as a statue. She has little to no modeling experience but once in front of the camera she turned out to be a real natural too! We had a great time! There is glitter everywhere and I bet I'll still be finding it for months too. It was well worth it! As I walked across The Boardwalk stage to take my place next to the drum set a guys voice rings out "TAKE OFF YOUR SHIRT!" I shoulda flashed him! Thanks to K who sent me this link there is news on the Devil Horns front... Who would have guessed. Ronnie james Dio, Gene Simmons and now John Lennon??!! The Beatles are still my favorites! 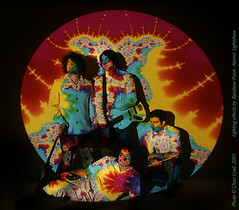 Shot band publicity pics for Model A today and John Sonderegger of Rainbow Prism Atomic Lightshow provided the lighting effects. Wowie! I'm already a kaleidescope, psychedelia, tie dye fanatic so I was in eye candy heaven. Sonderegger been working at this and developing his techniques since the 60's and there is just no end to the gorgeous patterns and colorful liquid effects that make amazingly vivid displays. Shooting it is no small feat however. Tricky tricky tricky. Still, we got some beautiful pics and the band was wonderful to work with! Model A has been working with Sonderegger for some time now and use the lightshow during performances. They'll be going on a tour soon but if you can catch them before they do you're in for both a musical and visual treat. A few months ago I was shooting the Warped Tour out at Sleep Train Ampitheater-- 40 Bands, thousands of concert goers-- insanity. While shooting pics of Flogging Molly from the stagefront pit area I saw this girl, what a face, pressed up against the security rail, flanked by two big guys. Her big eyes so compelling I had to shoot a quick picture before turning back to the stage. She saw me, I remember that. But after the three song limit we were escorted out and I never saw her again. Months later I was lamenting that I didn't know who she was because I turned the image into an art piece and it's become one of the most commented upon in my portfolio. A friend of mine came over one recent night and saw the photo. "I know her. She was one of my students!" My friend found her for me, the girl remembered me and sent her phone number along. Today I'm meeting her in person, print in tow as a gift. Amazing. It's a true small miracle and I'm awed by the powers of the universe. 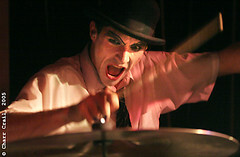 Brian Viglione, the drummer half of the Dresden Dolls pounds away with a multitude of extreme expressions washing over his face. His persona is so mime-like in his presentation and movements that when he actually speaks it comes a quite a surprise. It's an interesting mixture of cabaret meets children's toyroom with a bit of goth flavor mixed in. Their website calls it "...brechtian punk cabaret..." I haven't a clue what that means but I found their music unlike anything else out there right now and the mixture of her earthy storytelling lyrics, the rhythmic pounding of his drumming and her soulful piano to be a delicious mix. 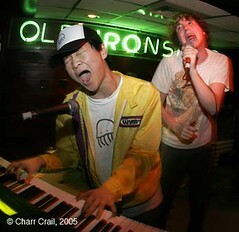 The musical duo originates from Boston and performed at Harlows last week to a sold-out crowd. 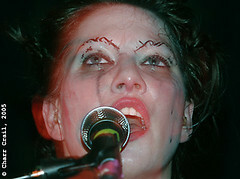 Amanda Palmer, pianist and vocals for the Dresden Dolls caught me by surprise when I began to see the tears streaming down her cheeks during a moving performance at Harlow's last week. 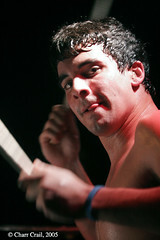 They played to a sold-out crowd, many of whom were dressed like Amanda and her drummer partner Brian Viglione. Palmer is partial to striped leggings. Viglione sports a derby. One really interesting thing about Palmer is her eyebrows. They are shaved off but she has the coolest patterns drawn in black that at first glance look like a simple criss-cross, but are really quite delicate overlapping soft swirls. I can't tell if they were painted on or tattooed on. Either way they were quite original and if I were tattoo inclined I would think that a very cool idea!